Book: Law and Language - John Witte, Jr.
​Completed in 1964, Harold J. Berman's long-lost tract shows how properly negotiated, translated and formalised legal language is essential to fostering peace and understanding within local and international communities. Exemplifying interdisciplinary and comparative legal scholarship long before they were fashionable, it is a fascinating prequel to Berman's monumental Law and Revolution series. It also anticipates many of the main themes of the modern movements of law, language and ethics. In his Introduction, John Witte, Jr, a student and colleague of Berman, contextualises the text within the development of Berman's legal thought and in the evolution of interdisciplinary legal studies. He has also pieced together some of the missing sections from Berman's other early writings and provided notes and critical apparatus throughout. 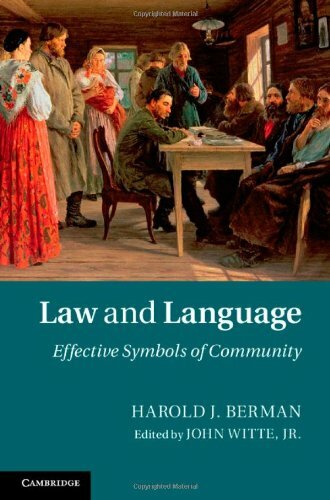 An Afterword by Tibor Várady, another student and colleague of Berman, illustrates via modern cases the wisdom and utility of Berman's theories of law, language and community. Conclusion: can communication build one world? Afterword: law and language – from Babel to Pentecost - Tibor Várady. "… makes a provocative contribution to the more recently established movement known as "law and language"."